Traditionally considered to be a remedy for scurvy, crates full of lime were always taken by sailors on their long voyages. Of course these days lime is a popular kitchen ingredient and a flavoring for cooking and drinks but its essential oil has various uses that you may not be quite as familiar with. I must say that I absolutely love the scent of fresh citrus fruit. We are lucky enough to have a lime tree in the garden and while it does not give us enough fruit to make any oils with, we use the fruit for cooking, drinking and also to freshen up the scent of the bathroom. Lime essential oil is derived from one of two lime trees known scientifically as Citrus aurantifolia. The Mexican lime tree and the Tahiti lime tree are evergreen, bushy trees which grow up to 12 feet in height with beautiful white blossoms as well as the familiar oval green fruit. Lime was originally native to South East Asia before spreading to Africa and Europe in around the 12th century. Today it is grown in many regions of the world with India, Mexico, Brazil and Spain being the largest producers. The essential oil you buy is produced from the peel of the fruit by a process of steam distillation or cold compression. Like the other citrus essential oils, it is full of medicinal properties that can benefit your health in many ways. These properties include antiseptic, antibacterial, antiviral and astringent activities among others. Like the other citrus fruits, limes are a rich source of natural antioxidants and beneficial nutrients which give the oil many health benefits that will be explored in detail below. Because of its excellent antibacterial qualities, lime essential oil can be applied to minor wounds, scrapes, burns and bug bites to speed up the healing process and prevent harmful bacteria from taking hold. You can apply the oil directly to the wound or ad a few drops to a cold compress and apply the compress to your skin. Lime essential oil also has effective antiviral abilities which can protect against the type of common viruses that lead to colds and influenza. Simply diffusing lime oil throughout the day will not only help relax your mind and improve your feelings of well-being but can also guard against these annoying viral sicknesses. If you are suffering from toothaches or gum disease, I feel for you. As a person who has suffered his fair share of teeth and gum disease, nothing makes me feel quite as miserable. Eating is difficult if not impossible and the pain in your mouth can have a debilitating effect as well as causing you to lose sleep. The good news is that essential oils such as lime can be put to use on your oral problems with great effect. Because it is antibacterial, lime essential oil can help kill the bacteria causing your oral infections and its astringent properties mean that it can also strengthen the gums which gives your teeth a firmer footing. The scent of lime essential oil can stimulate the digestive juices meaning your food will be digested more easily. Lime oil can also boost appetite which is often necessary when you are recovering from illness. Not only does lime oil help treat external infections but it can also help destroy internal bacteria which may be causing problems in your digestive tract. It can be used to treat diarrhea and food poisoning among other problems. Inhaling lime oil can help treat congestion and other respiratory conditions caused by the common cold, flu or bronchitis. Its antiviral properties help prevent the illnesses in the first place while it also has properties that can help you breathe more easily after you are sick. There are several inhalation methods that will free up your respiratory system and help you breathe more comfortably. You can of course inhale your lime oil directly from your bottle or from your hands but it is probably more effective to make a steam inhalation. To do this, add 5 or 6 drops of your lemon oil to a hot, steamy sink of water and lean over it with your upper body covered by a towel. Inhale those rich, soothing vapors for at least 5 minutes and you should find that you are breathing far more easily. If you are one of the vast number of people that suffer from acne then lime essential oil may prove a very useful ally. Simply apply a few drops of diluted lime oil to the affected areas and its antibacterial and cleansing ability may help limit the breakout. Lime oil also contains astringent and antioxidant properties that will help rejuvenate the skin. 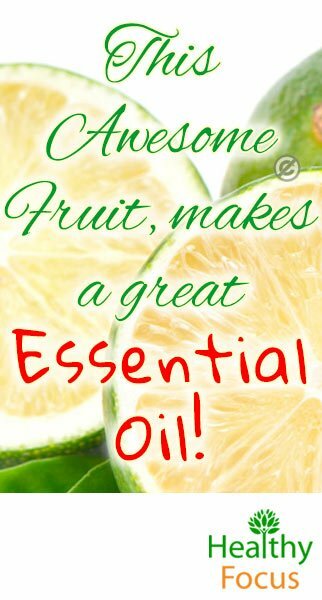 It is best mixed with a skin friendly base oil like coconut oil or jojoba but please note that it may increase photo-sensitivity (like most citrus oils). So to be safe you should avoid direct sunlight for 24 hours after lime oil has been applied. Because of this, other essential oils may be more suitable for treating the skin on your face. Simply inhaling this therapeutic oil can help alleviate feelings of stress and anxiety. Of course, the sense of smell is very subjective and not everybody will feel its benefits bit for those of you who are plagued with emotional issues, lime essential oil is one of the oils that can provide a potential safe and effective alternative to the prescription medications that so many people take. Lime essential oil can help to boost a weak immune system and stave off illness. It is a wonderful tonic for people whose immune system may be low when they are recovering from illness or surgery. Like many essential oils, lime oil can provide excellent pain relief whether you are suffering from chronic joint pain or you simply need to relieve muscular aches following a hard day on your feet. You can combine your lime oil with a carrier oil to make a natural and extremely effective massage oil or simply add 5 or 6 drops to your bathwater. Lime essential oil can help treat scalp issues like dandruff and can be applied directly to your hair to breathe new life into it. Whether you are suffering from dandruff or just feel your hair is lacking life, simply add a few drops of your lime oil to your regular shampoo and wash as normal. Diffuse: adding a few drops of lime essential oil to your diffuser machine can help stave off feelings of anxiety and boost immunity. Inhale: for respiratory issues, inhale it directly from your cupped hands or make a steam inhaler by adding a few drops to a sink of hot water. Massage: dilute your lime oil with a suitable carrier oil and massage it into your aching joints and muscles. Topical application: to treat wounds, cuts and skin complaints. Shampoo: add a few drops to your regular shampoo to improve the health of your hair and scalp. 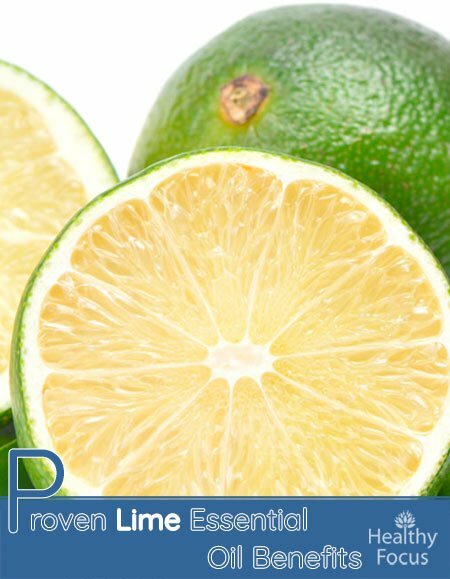 Lime essential oil is generally considered to be safe for topical use and inhalation but there are a few precautions that you should be aware of. As with most citrus oils, lime oil may be photosensitive meaning that it can cause a reaction when it is exposed to direct sunlight. Reactions are potentially severe and exposure to UV light following the application of lime oil may cause burning, skin discoloration or rashes. It is recommended that you avoid exposure to direct sunlight for at least 24 hours after applying lime oil to your skin. Taking lime oil in small quantities internally may be safe but ingesting essential oils is potentially dangerous and should generally be avoided. Make sure that you dilute your oil in a suitable base oil before applying it to your skin. Citrus essential oils like lime oil can damage some diffuser machines so please check your manufacturer’s recommendations before using it in a diffuser.